Secrets at Sea is simply "one billion thumbs up," according to The Little Sister. She explains, "the mice have human friends, a mouse restaurant, they go on a boat to England and a lot of... MICE and FUN!" 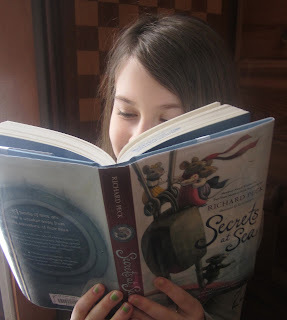 The Big Sister shares that "I loved this book, even though I am almost 12. The book takes something that a young child would like and turns it into something for all ages --who wouldn't love a book with a mouse that saves the day by hiding in a woman's bosom?" She said, "please include a smiley face," so ;)! Secrets at Sea by Richard Peck! The Mom read Secrets at Sea aloud to The Sisters and each of us enjoyed this new book by Richard Peck for myriad reasons. Imagine: the mice put on clothes when they get home and take them off when they go out into human territory. The ultimate goal is to keep their truth --their brilliance-- hidden, revealing it only to the most deserving humans. As they venture out into the world, they have to survive and they do, with style. They do more than survive though, they thrive. And they teach us that it never hurts to want something more and to trust that taking care of yourself is always a good idea. Thanks to the Horn Book Magazine for keeping us up to date on all the wonderful children's books out there! Remember, we mentioned their wonderful piece by Richard Peck and shared more, click to read more. The Mom is often asked how she keeps up on all the good books out there. Well the Horn Book Magazine is one secret and the other, no secret at all, we go to the library a LOT!! So, turn off the computer and head to the nearest library and check this one out! can't wait to read this - and have reserved it at the library. thank you!